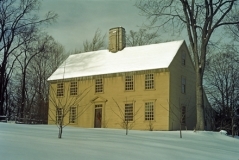 Parson Barnard House (1715), North Andover, Massachusetts; Winter view in snow (1973 image). 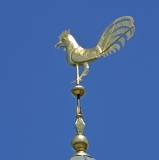 Weathercock (London, 1723), West Parish Meeting House, Barnstable, Massachusetts. A cocky bird, seeming to defy the very elements he surveys. 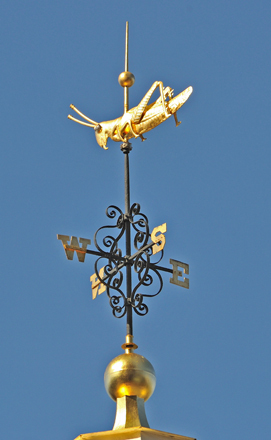 Like the original congregation, his provenance is London, England. West Parish Meeting House (1717-23), Barnstable, Massachusetts; Exterior in spring. 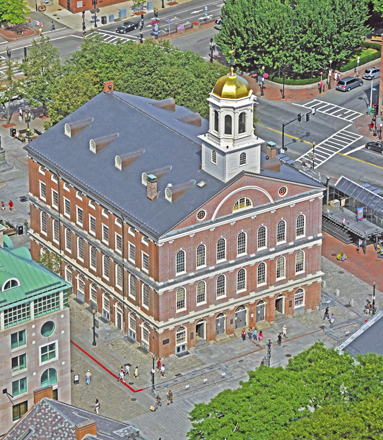 Faneuil Hall (1742 - enlarged 1805), Boston, Massachusetts; East facade and South side. 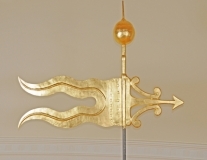 Donated by Peter Faneuil in 1742. Enlarged 1805 by architect Charles Bulfinch. "Cradle of Liberty". Place of many controversial meetings in colonial days and prior to US Civil War. 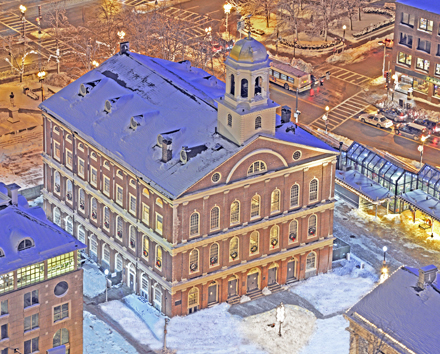 Faneuil Hall (1742 - enlarged 1805), Boston, Massachusetts; West end on winter afternoon. 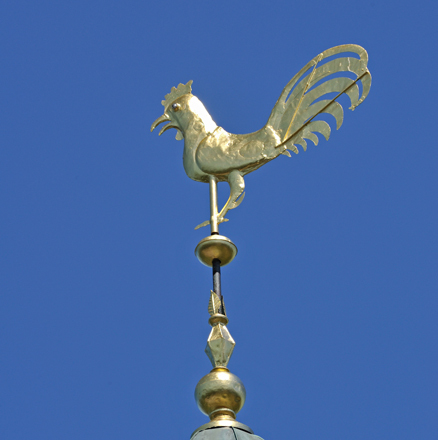 Bulfinch's 1805 enlargement moved the cupola and weather vane to the east end. 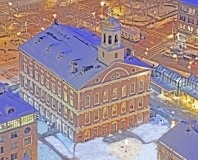 Faneuil Hall (1742 - enlarged 1805), Boston, Massachusetts; East facade and South side in winter. 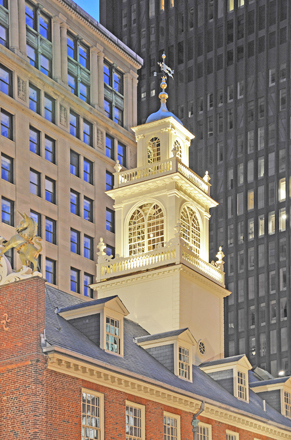 Old State House (1713), Boston, Massachusetts; West end. 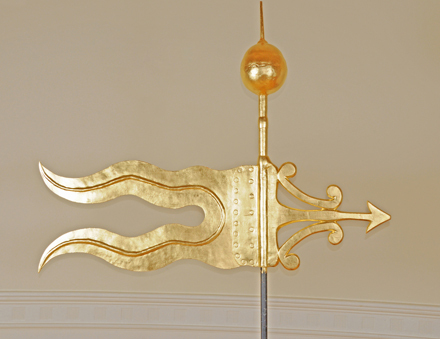 Seal of Massachusetts Bay Colony at top. Volutes in stepped gable end. Angular pedimented door. 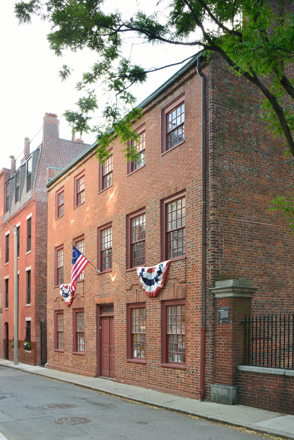 Ebenezer Hancock House (c 1767), Marshall Street, Boston, Massachusetts. 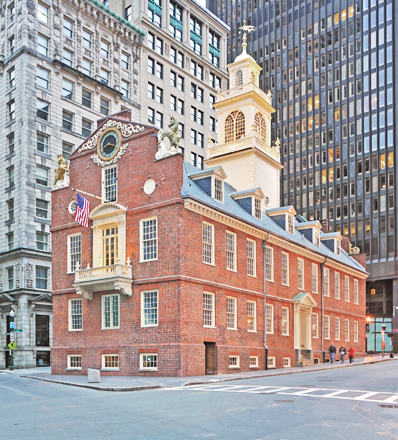 John Hancock's brother, Ebenezer used this building when serving as deputy paymaster of the Continental Army during the American Revolutionary War. 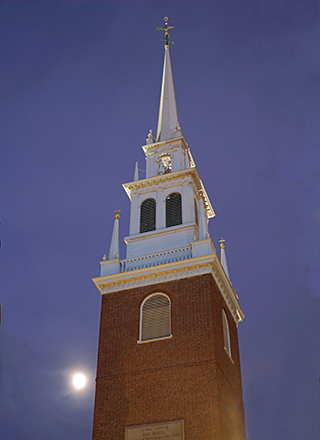 Old North Church (Christ Church) (1723), Boston, Massachusetts; view of tower at night. 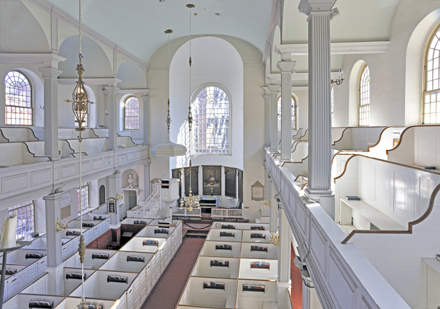 Old North Church (Christ Church) (1723), Boston, Massachusetts; View from West looking down Hull Street. 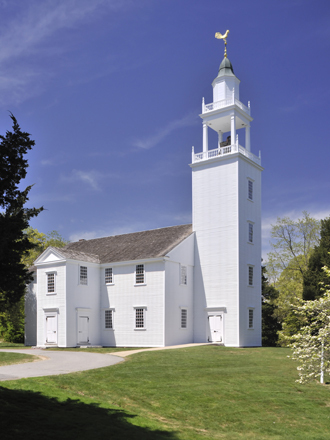 Steeple held lanterns warning of British march to Concord April 19, 1775. Brick tower, wooden finials on two stage top with high spire. 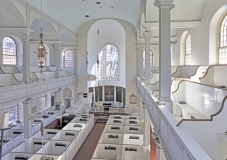 Old North Church (Christ Church) (1723), Boston, Massachusetts; Interior looking east toward altar. Fluted columns at gallery level, panelled gallery, box pews, pulpit with sounding board (canopy), Anglican altar. 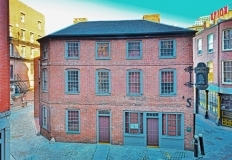 Clough House (1712) North End, Boston, Massachusetts. This lonely survivor of early eighteenth century North End, Boston, stands just behind Old North Church which Ebenezer Clough, its first resident helped build. 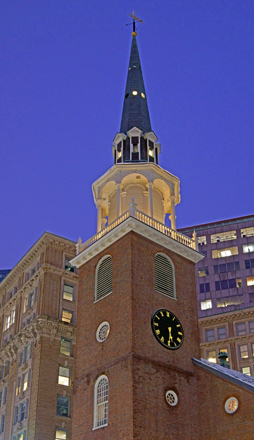 Old South Meeting House (1729-30), Boston, Massachusetts; view of tower at dusk. 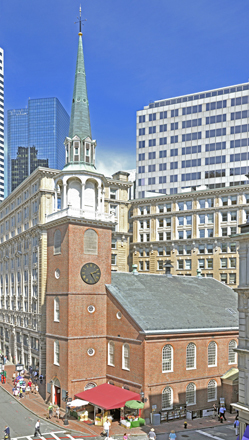 Old South Meeting House (1729-30), Boston, Massachusetts; View from southwest. Brick meeting house with prominent brick tower at west end - octagonal wooden colonnaded cupola with spire at top. 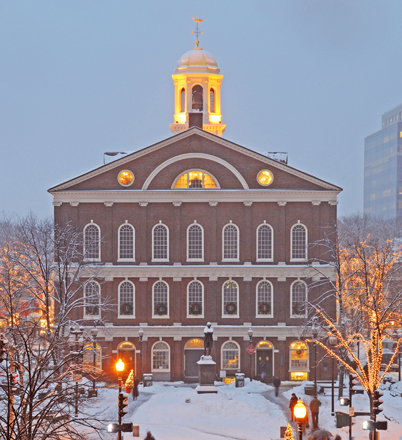 In late colonial times political meetings were held here when a large crowd was anticipated. Preliminaries to the Boston Tea Party took place here. 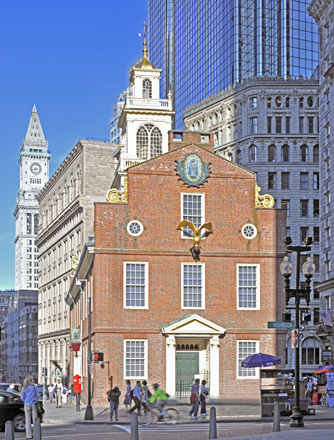 During the British occupation of Boston used as a riding stable. 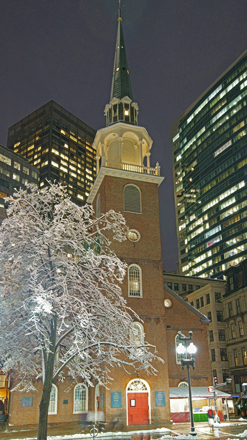 Old South Meeting House (1729-30), Boston, Massachusetts; Facade on winter night.